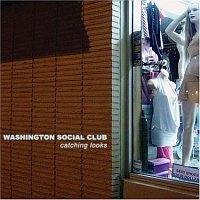 In Music We Trust - INTERVIEW: Washington Social Club: Washington D.C.'s hottest indie rock act discusses debut record, etc. Washington D.C.'s hottest indie rock act discusses debut record, etc. Washington D.C.-based foursome Washington Social Club, last spring, unleashed one of indie-rock's most promising debuts, Catching Looks, released on prominent indie Badman Recording Co.
Fronted by singer/songwriter/guitarist Martin Royale, the band is rounded out by Olivia Mancini on bass, Randy Scope on drums, and newcomer Evan Featherstone, who was brought into the band in August to help fill out the live sound and make them a much fuller unit, on guitar. "We had it done for ten months before it was released," says Royale of Catching Looks, a record that has lauded plenty of critical acclaim, including an appearance on Last Call with Carson Daly. Catching Looks, a collection of fun, positive-charged indie-rock-gone-early-90s-pop anthems is fueled by both a love of hooks and a punk energy that helps, along with the vocals of both Royale and Mancini, deliver a sugary, but still punchy sound that is bound to make you sing-along and put a smile on your face. 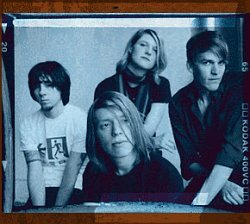 Catching Looks started out as a demo that Royale and the band would pass around to get word out about the band and to get gigs. But as things started to develop and take shape, and as the band evolved, so did the songs. "A lot of those songs were the first songs we recorded as a band and then we re-recorded four of them from that demo for the album," Royale recalls. "The rest were the ones that came easiest to the band," Royale says of song selection process for Catching Looks. "Not too much conflict there. We were all on the same page on what songs to record." Following the recording sessions at Brian McTear's Miner Street Studios in Philadelphia, the band sent out several copies of the record to various labels, via their management, and just weren't coming up with much. Then Dylan Magierek, founder of Badman Recording Co., heard the record, fell in love, and offered the band a deal. "We're not your typical Badman band," says Royale, "But they're a great label and have treated us real nice. And Dylan is a huge fan of the band. You couldn't ask for more". Following the release of the album, the band hit the road, embarking on their first U.S. tour, which went well. The band is currently now seeking supporting slots for more established bands, while they play as much as they can in their region, constantly writing and recording, preparing themselves for their next album. "When you tour you get looser in what you feel you can do with songs and at the same time you get tighter as musicians with each other," Royale says of the live songs compared to the record. "You just get really good together. We're always getting better." One of the notable differences between the record and the band, especially with the addition of Featherstone, is the sound. The band sounds much bigger live than they do on the record, according to Royale. "When we were just a trio, people would always comment that the record sounded bigger than the live show. But now that we have a second guitarist, people always note that we sound bigger live than we do on record," replies Royale, when asked how the live show differs from the studio recordings. The band will be doing the upcoming Warped Tour, something they're excited about, while also working on their next album, something they hope to record next summer. "We're always constantly writing," states Royale. "We could do it now, another record. But within a year, at least, I'm hoping we get in and do it. "The first record was a learning experience and we now know all the stuff to apply to the next record. We want to record live the next time, put it down as a live band and work from that." He finishes the interview by telling me, "We have a lot of material and the more we work together, the more tools we have to work with."